Dog grooming is a very important part of dog ownership. It not only keeps your pet looking and feeling great, if you do it yourself (and it's really not that hard) there are many other benefits of grooming your dog at home as well. Grooming the Miniature Schnauzer is the process of removing most of the body hair from the top and down the sides and back, while leaving longer furnishings on the Schnauzer's legs and underbody. The face is then trimmed and shaped to enhance their eyebrows and beard. Before the actual cutting begins make sure you brush your Miniature Schnauzer out to ensure the hair is free of knots and mats. Also gather up all the grooming supplies you will need (clippers, scissors, comb brush, towel, treats, etc.) as well as the dog first aid kit... just in case. Clipping Schnauzer Body: With your Miniature Schnauzer standing, begin clipping (using a 9 or 10 blade) from the back of your Miniature Schnauzer's skull (or top of his neck) down to the base of your Schnauzer's tail. Continue clipping along the sides of your Schnauzer's body stopping just about an inch above each elbow. Use this as your stopping point of reference... i.e continue clipping down the sides but do not cut below the point of reference, so the underbody furnishings remain. dog grooming tip: Make sure to have the clippers facing downwardto blend the dog hair evenly into your Schnauzer's underbody furnishings. Trimming Schnauzer Legs & Tail: When trimming your Schnauzer's legs, only clip the sides so that they blend in. Do this by brushing the hair upward at first and then gently combing it back down. Snip off the extra hair to the desired look you want. Next clip your Schnauzer's tail completely or if you prefer leave a bit of fringe on its back side. 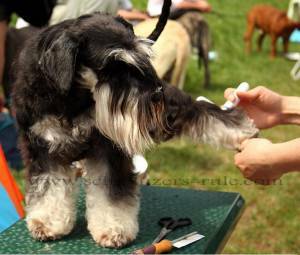 Schnauzer Head & Chest: Have your Schnauzer facing you as you begin clipping his front area. Start just under the neck and clip downward to the breast bone. Next, raise your dog's head and clip against the grain, up under your Schnauzer's throat and on both sides of the head. Then lower the head and begin clipping against the grain, along the top of the skull and stopping just before the eyebrows. Now you're ready to clip your Miniature Schnauzer's ears. Run the clippers downward and outward. Clipping both the outer side and underneath side. Use scissors to shapen each ear by holding onto the the earflap and guiding the scissors around the edges. When finished, go ahead and clean dog ears, too. The last step is to cut your Miniature Schnauzer's eyebrows and beard. Use a pair of scissors to do this. Simply comb your Schnauzer's eyebrows down towards his nose and cut at a sharp angle towards the outside corners of each eye. Trim the very tip ends of your Schnauzer's beard only, again using scissors and in an angle just to shape it up a bit and remove any uneveness so it blends in. If you like, download our Schnauzer Grooming Chart. It's free and can serve as a handy reference until you master dog grooming. Subscribe to Secrets of Professional Groomers A Free Mini Course where you'll learn how to groom your Schnauzer yourself, right from the comfort of your own home. It will strengthen the bond between the two of you. 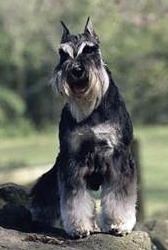 Your Schnauzer will love the time spent together and the tenderness of your touch. You will save the money that would have been spent at the salon. And if you make a habit of setting aside the money you would have spent at the dog salon, you will accumulate a nice sum to spend on something else. Your Schnauzer is safer and more comfortable in his own home. No more worries about your dog being left in a kennel waiting for his turn or the fear of strangulation because he was left unattended on the table for just a few moments. 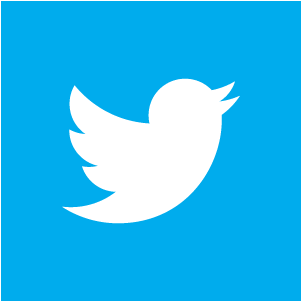 It's a time saver as you will no longer need to work around salon appointments or have to drive to and fro. You get to choose the grooming products to use on your Mini Schnauzer. Some dog allergies are brought about by exposure or contact with harsh detergents and chemicals. Early detection of any abnormalities (like dog lumps and bumps) which could require medical attention. And early detection is the the key in battling illness and disease. It's relaxing for you too. Once you are comfortable with the process, dog grooming is a very calming and quiet time that you spend with your dog, which in turn, may actually help to reduce your stress and blood pressure. "Knowledge Share"... If you found this article on Schnauzer dog grooming helpful and informative, please share it with your dog-loving friends by clicking on one of the share links (like facebook, twitter, and google +1) located at the top right or bottom of this page.